Skills and abilities: Street fighting skills, law degree and an experienced DA. Powers: Helmet of Heru– A mystical helmet containing the spirit of Justice grants bulletproof body armor, superhuman strength, speed and agility, retractable claws, shuriken like boomerangs and grapple hook to swing from building to building. Also possessed an undeveloped connection to “Nommo” a repository of knowledge and skills shared by every wearer of the helmet of Heru. It also contains all the spirits of past wearers allowing the current to talk to them all. Paul grew up with his mother in Harlem. After his father died he almost turned to crime but managed to stay on the straight and narrow when Richard Woodroe a case worker took him under his wing. 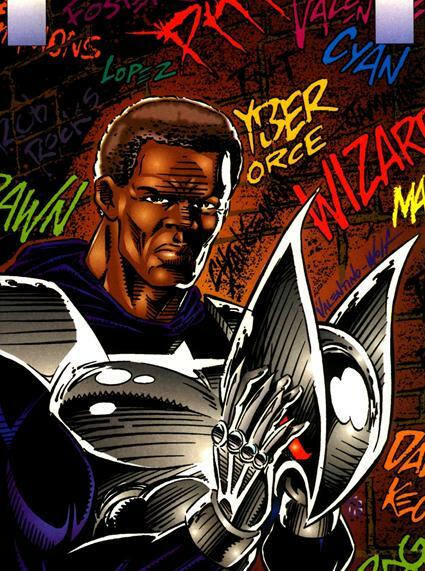 Woodroe later married his mother and his half brother Hojo was born [Shadowhawk III #1 1993]. Paul grew up to become a lawyer and later a district attorney. He refused to take bribes from the mob which made him a target. The mob had him assaulted in his office and injected with HIV infected blood. This was made public knowledge and his coworkers started displaying paranoia and phobia in regards to his status. His frustration lead to assaulting a coworker which got him fired and jailed [Shadowhawk III #2 1993]. Here he received confirmation that he was in fact HIV positive [Shadowhawk III #2 1993]. Walking the streets had him mugged and sent back to the hospital [Shadowhawk III #3 1993]. His friend Christina told him of a suit of armor which would help him “take back the streets” [Shadowhawk III #3-4 1993]. Vowing to use the remainder of his life for good, he trained extensively in armed and unarmed combat as well as gymnastics [Shadowhawk III #3-4 1993]. Paul knew of the broken criminal justice system which would release the criminals turned over to them and he would not kill since he held all life dear he instead would shatter the spine of his victims so they would be prisoners of their own bodies. As a crime fighter he became something of an urban legend as he would leave criminals for the police to discover but was never seen by them. He battled super-villains as well. When news that his brother had overdosed on drugs reached him he got reckless and was attacked by Savage Dragon. He went into hiding briefly before resurfacing in search of a cure. In a fight with Supreme he was unmasked on TV revealing his identity to all. He also bonded with fellow Aids victim Chapel but his worsening medical condition lead to his capture and death in a hospital. Upon dieing he joined the many other spirits of past wielders of the Helmet in the Nommu. When his successor was beaten to death his father offered his soul for help and was transformed into Paul during image united. He has since returned to vigilantism. Pingback: Comic Book Superheroes: Who has HIV, Who's Immune?